Ever been excited about going out to a Michelin starred restaurant for a big night out – and found that there’s nothing – absolutely nothing – vegan on the menu? There’s a misconception that vegan food isn’t gourmet. That it’s boring. That it’s basically rabbit food. But personally, I find it’s absolutely to the contrary: how many ways can you dress up a dead animal to make it look fancy? Veggies, on the other hand, can be transformed in an absolute wealth of ways – which make them perfect for gourmet cooks. So, what constitutes gourmet food, exactly? The answer is twofold: presentation and attention to detail. You can’t just slop something on a plate and call it ‘gourmet’ – no matter how tasty it may be. And when I say attention to detail, I mean, each little bit has something special about it: maybe there’s a sauce, maybe there’s a mousse or a garnish. 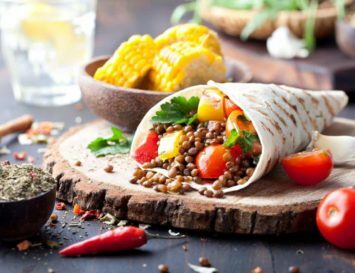 It takes a bit longer to make these gourmet vegan recipes, but the labour is worth it – these are vegan delicacies you won’t make every day, but when you do, they’re bound to impress. Salty, savoury, and a little bit smoky, this vegan side dish sounds very meaty indeed, but it’s anything but! Serve it up with some pureed peas or mashed potatoes and salad for a wonderful meal. Looking for a starter to really wow guests? 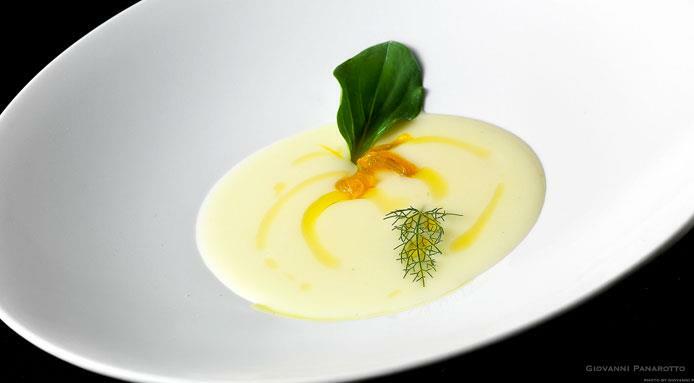 Serve up a dollop of potato cream soup with caramelised leeks and garnish it with saffron and oyster leaves. The recipe only serves one, so you’ll need to keep that in mind for however many guests you’re serving. Proof that vegan soups don’t need milk or cream! 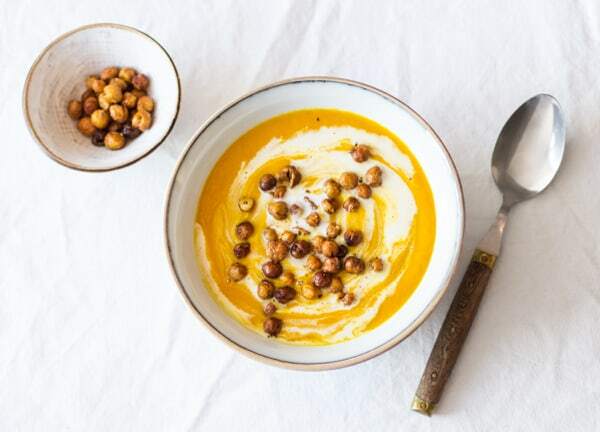 This rich, flavourful soup is bursting with warming ginger and is given a surprising touch with the addition of crunchy, nutty roasted chickpeas. 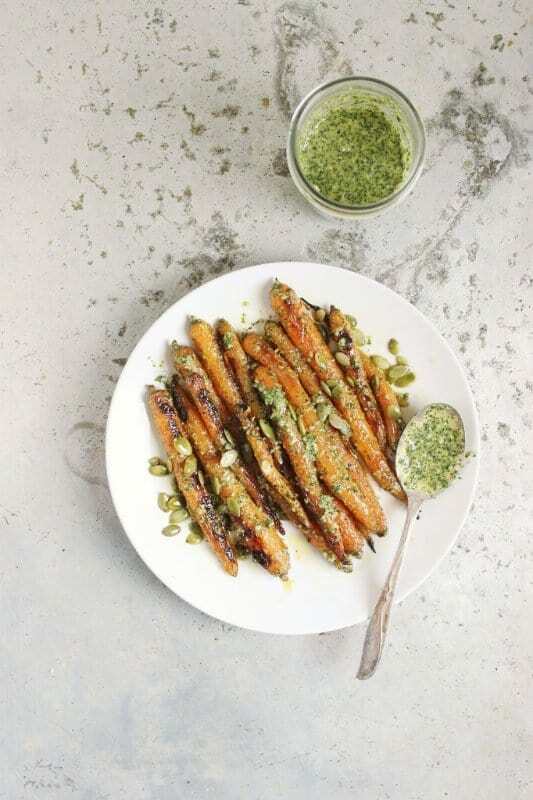 Sure, steamed fresh veggies are wonderful on their own, but when they’re smothered in a creamy, savoury dill pesto, well – that takes them to a whole other level. An added gourmet touch? All those crunchy seeds on top! This recipe is super quick and easy to make, and serves as a wonderful starter or lunch dish. 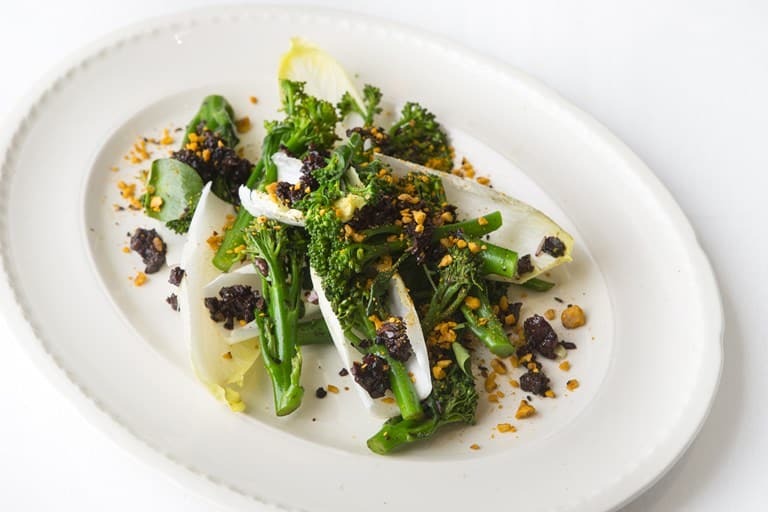 Tender baby broccoli is matched with a whole variety of textures, from crunchy hazelnuts to the sticky sweet olive dressing. This fennel salad just goes to show how vibrant and stunning salads can be. 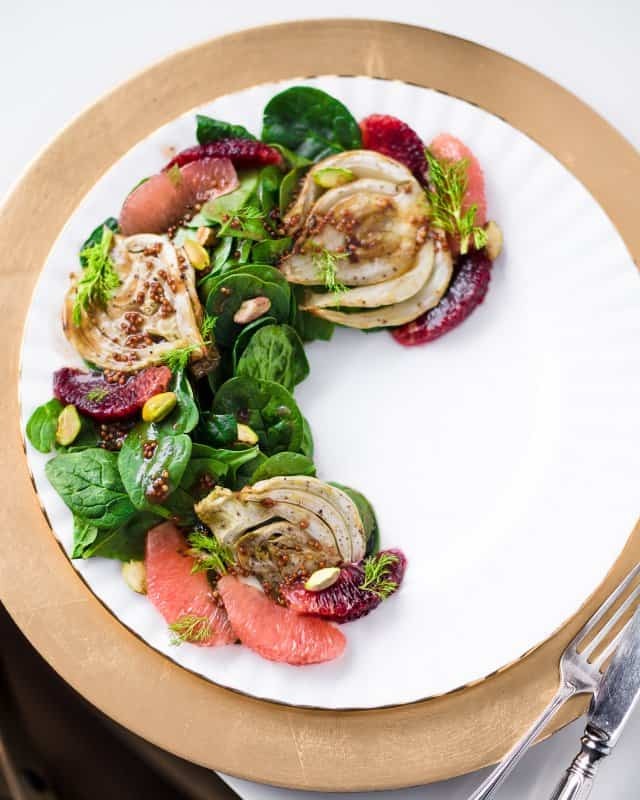 Fennel and blood orange are a classic combo, all set off with bittersweet grapefruit, crunchy roasted pistachios and a tangy dressing. As I mentioned, when it comes to gourmet dishes, presentation is everything. 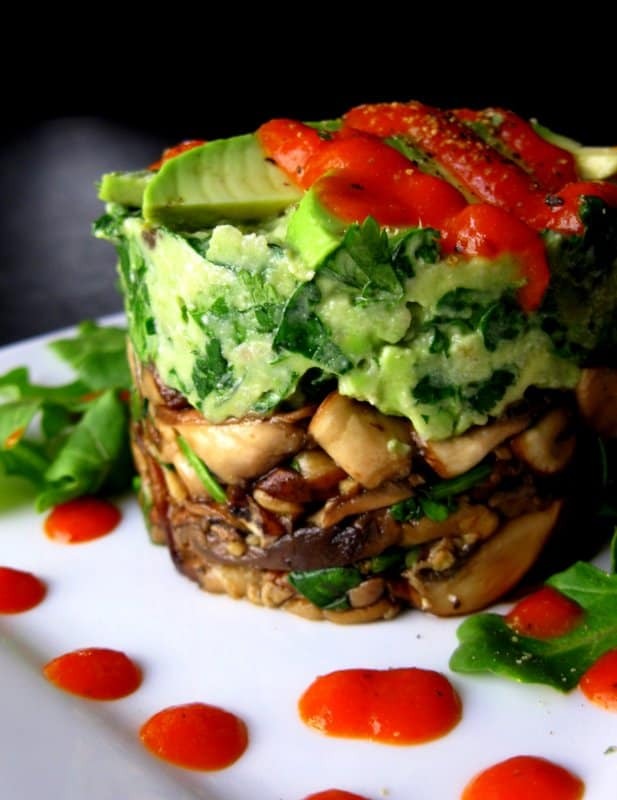 Whilst a pretty simple recipe, these Peruvian quinoa, avocado and sweet potato timbale stacks are stylishly presented – though personally, I would whip the sweet potato and avo into a mousse to make it all hold together better. Have you ever seen a salad look so picturesque? 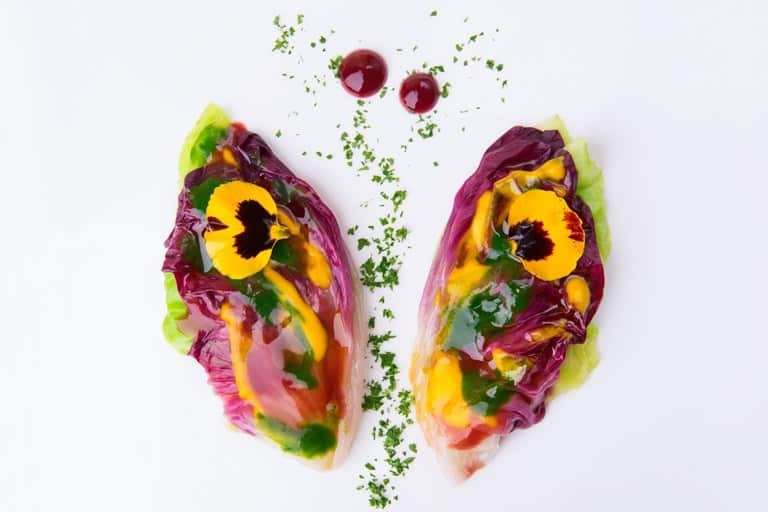 Made from radicchio and cabbage leaves, exciting sauces and purées such as the almond and beetroot mayonnaise give this salad dish its flavour, as well as a pop of bold, vibrant colour. It’s all finished off with pretty, edible flowers. 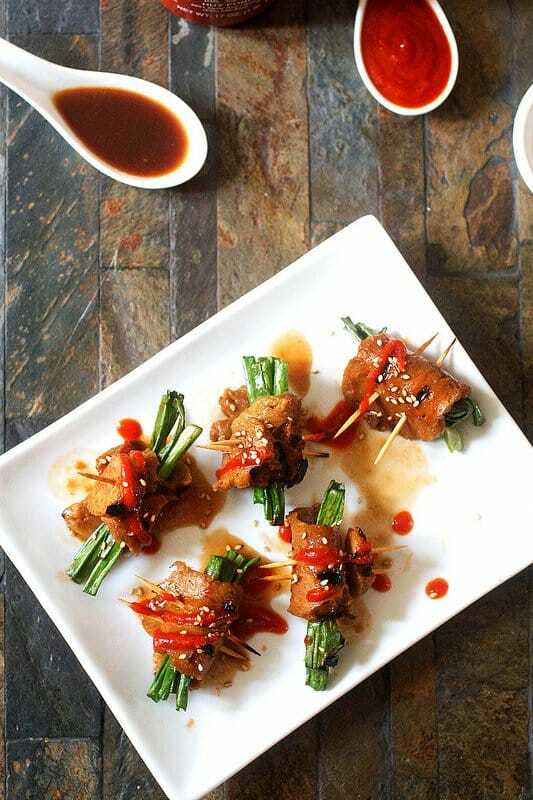 Negimaki is not only given a vegan makeover and made using seitan, but is made to look super fancy in this dish by the culinary legend Isa Chandra. 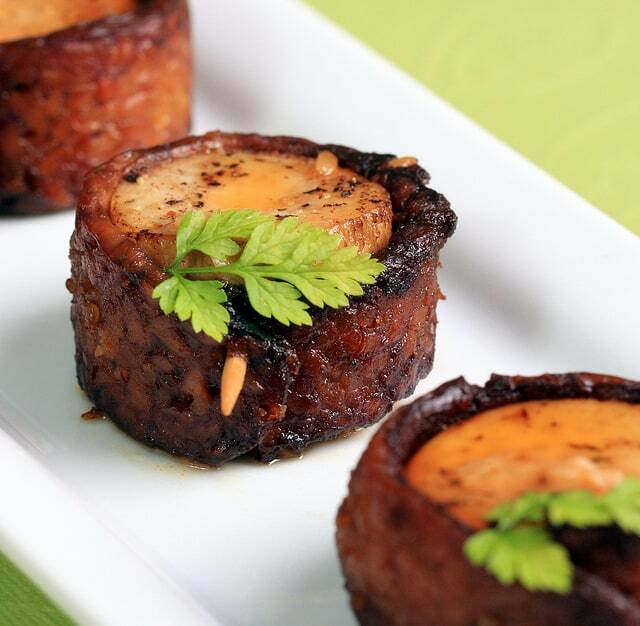 Drizzle the negimaki with a simple marinade of hoisin and mirin to give the perfect marriage of sweet and savoury. This is a construction of big, bold flavours! 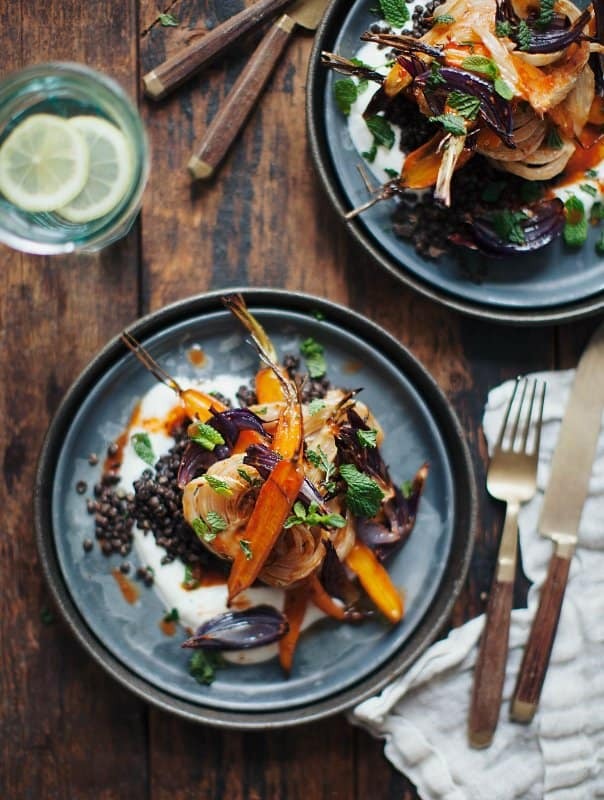 The first bite will tantalise the taste buds with roasted veggies dripping in a smoky sauce; as you dig further; you’ll taste the lemon-spiked yogurt and spicy harissa (but to keep this dish vegan, just use a plant based yogurt). 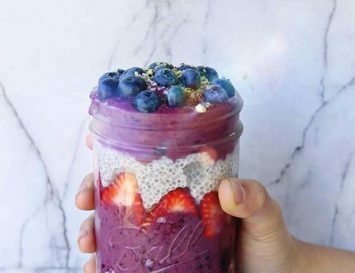 How fabulous does this recipe look? First, a bed of quinoa is made, and then topped with Romanesco broccoli, raw beetroot and a pesto dressing. Serve this up to guests and just wait for your Michelin star! 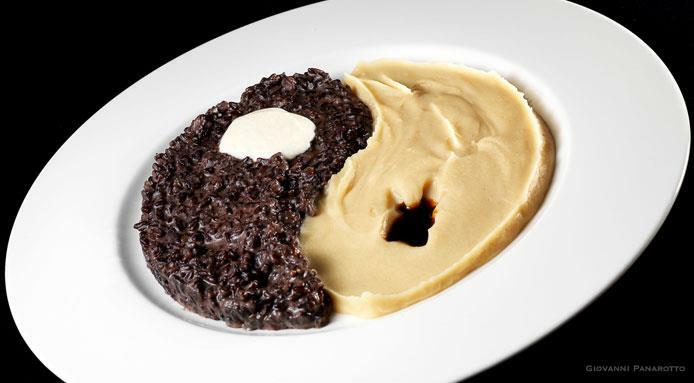 Bring a ying and yang vibe to your cooking. 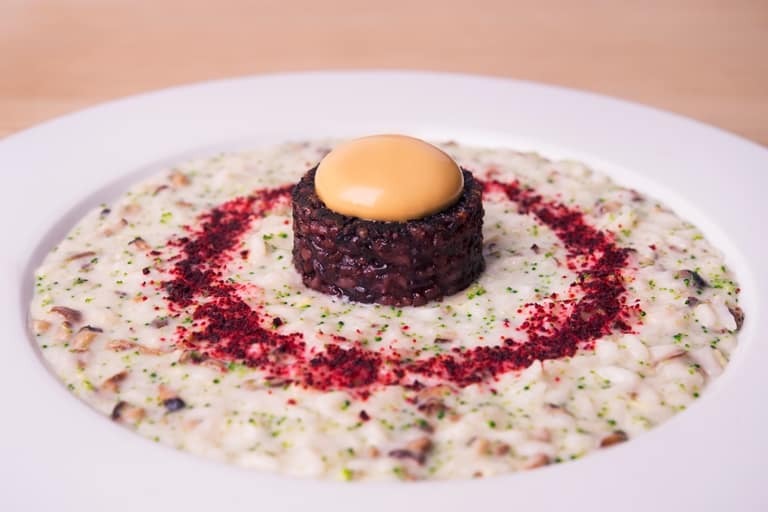 The creamy element of this dish is made from blended hazelnuts, whilst black rice is given a tangy, smoky flavour from tamari. Creamy avocado. Sweet red peppers. Smoky wild mushrooms. 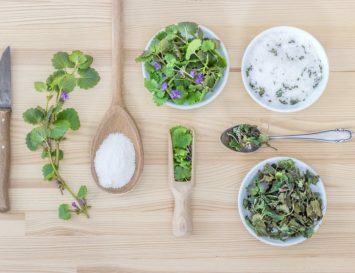 They all combine with herbs and spices to create a gorgeous vegan symphony! 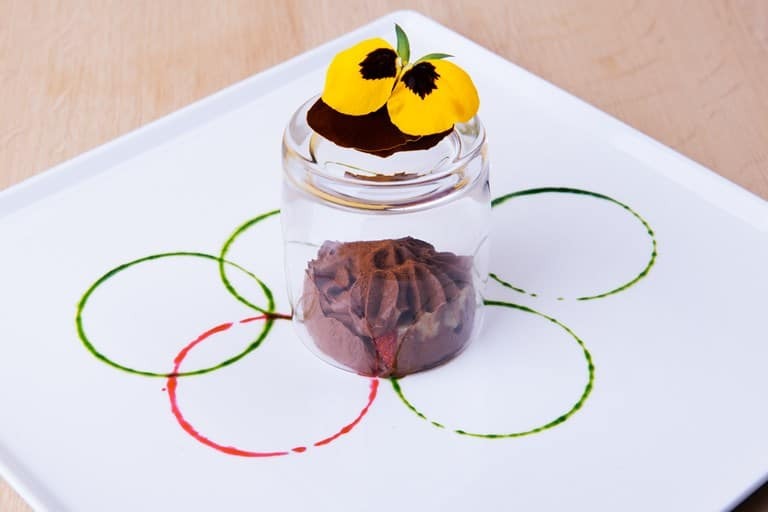 Tip: you might want to invest in a ring mould to make this dish and others like it: then you can stack each element without fearing it will crumble. Relatively easy to make, this is a wonderfully presented starter, or can even be served as a main, alongside stacks of rice or quinoa, with a salad. 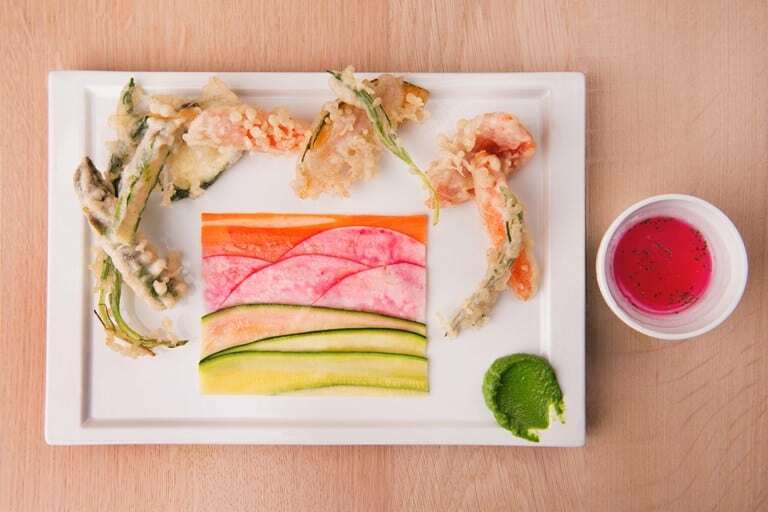 Zoodles have never looked so darn fancy, right? 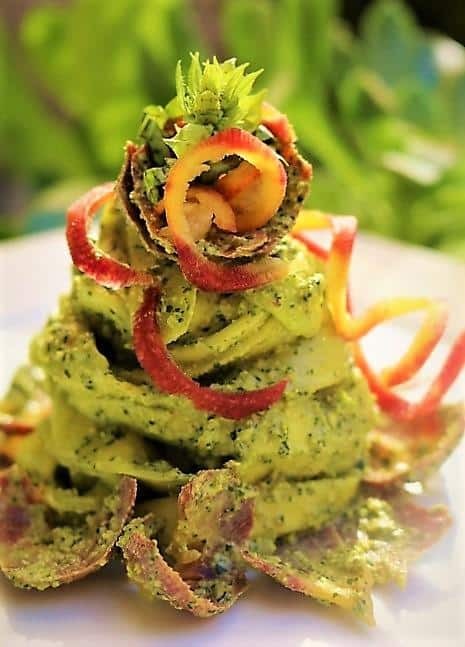 The carrot and zucchini noodles are topped with a pistachio pesto sauce, and then made into a glorious tower. The best part? This entire recipe is raw, so no cooking is required. Whilst delicious, a potato salad doesn’t exactly scream gourmet, does it? 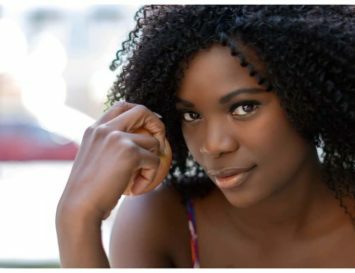 Well, prepare to have your mind changed! 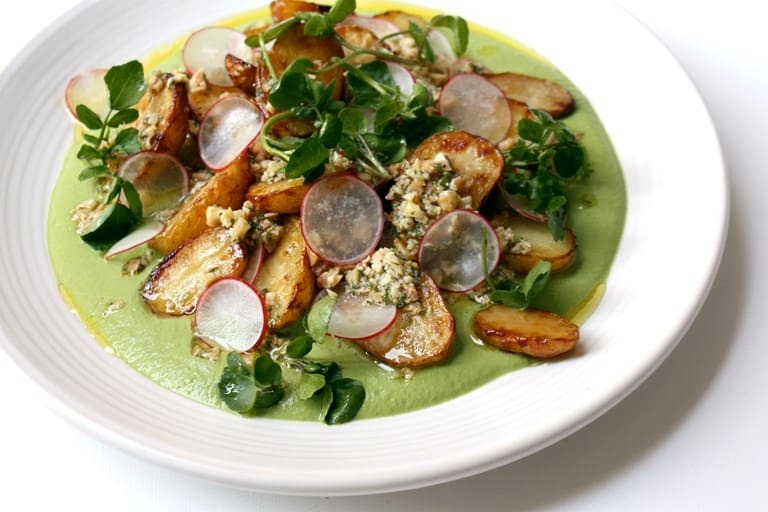 Watercress sauce is enriched with soaked and blended cashew nuts to make it wonderfully creamy, whilst marmite-roasted new potatoes provide an umami punch. 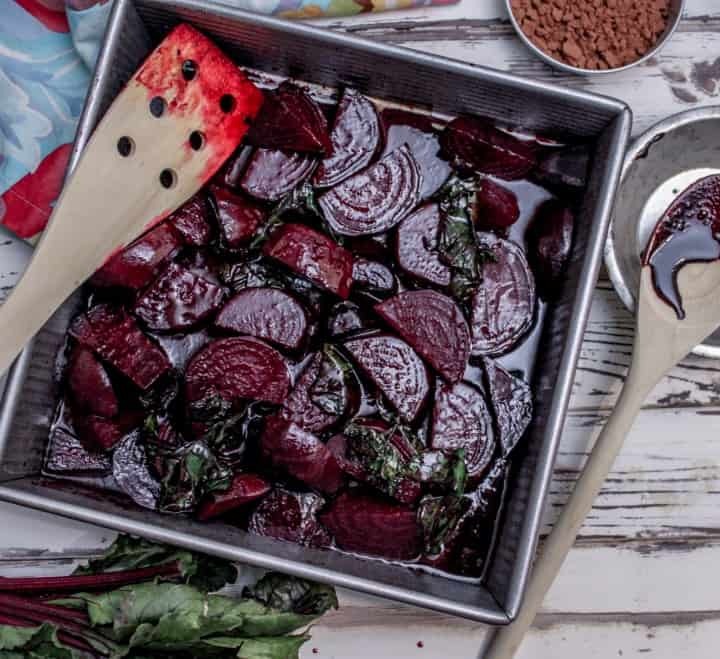 It’s no surprise how well balsamic compliments the earthly flavour of beetroot, and here, the chocolate just adds a touch of sweetness to enhance the flavours you get from the sweetly roasted root veggie. Serve this up with some rice and salad to form a main course. Got meat eaters coming for dinner? They’ll love this! 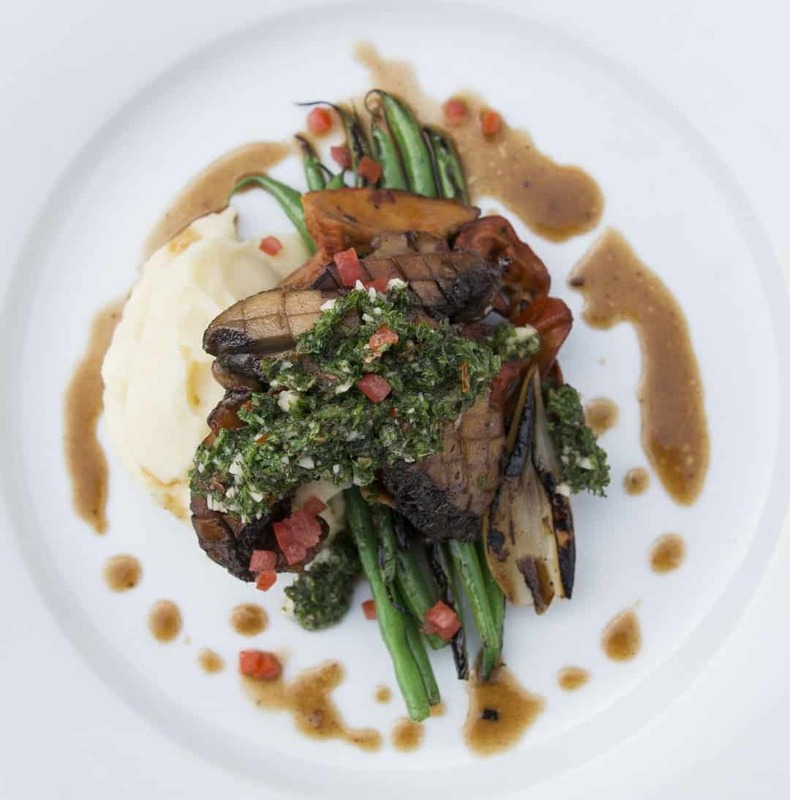 Portobello mushroom steaks are pan roasted and then braised in a light stock to become the ‘turf’ element of the dish. Lobster mushrooms make up the ‘surf’ part, and are combined with a light potato puree. 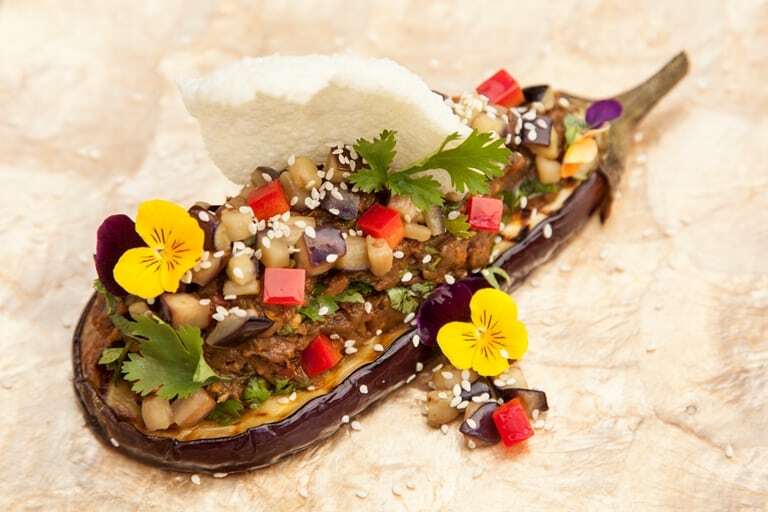 This Sichuanese aubergine recipe again showcases how a humble vegetable can be turned into some truly delicious dishes. 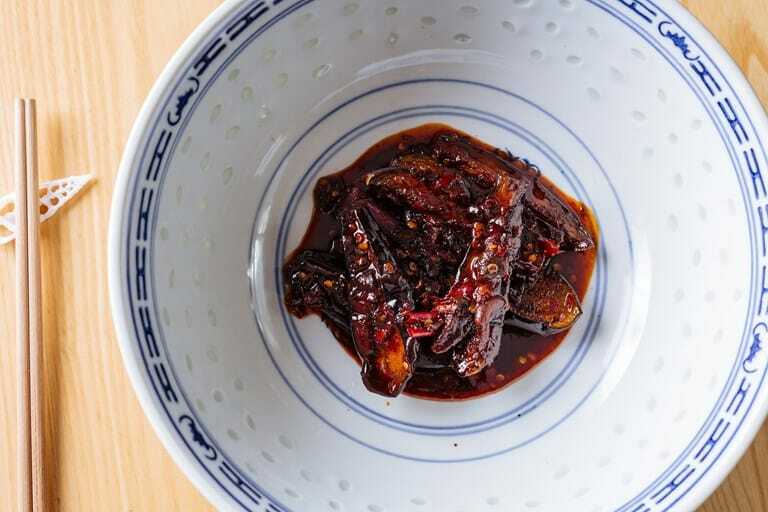 The silken aubergine flesh is paired perfectly with the heat of the chilli bean paste to create a must-try side dish that is both intense and warm without being overwhelming. 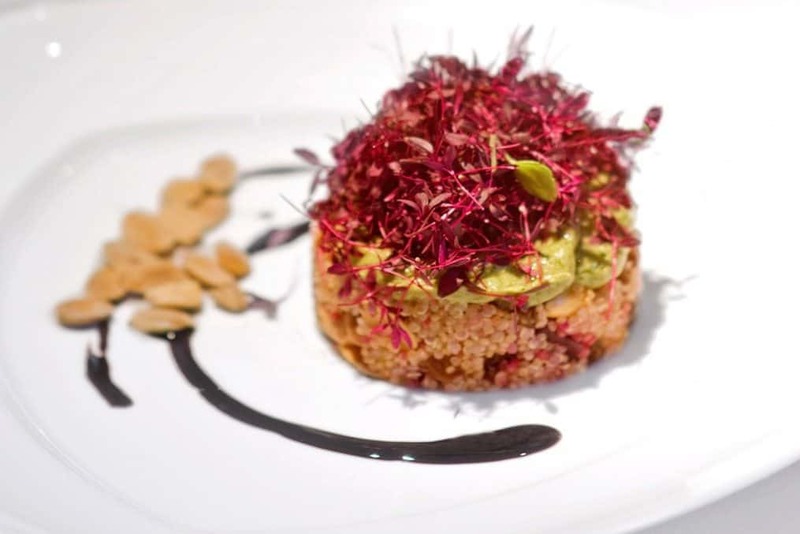 Considering that this recipe has been created from the head chef of Italy’s only Michelin-starred vegetarian restaurant, it comes as no surprise that it showcases vegan cuisine as its finest. The veggies are coated in a crunchy tempura batter and served with a tangy and powerful wasabi pesto sauce. Feel free to change the vegetables to cater to what’s in season. Sometimes, simpler is best! 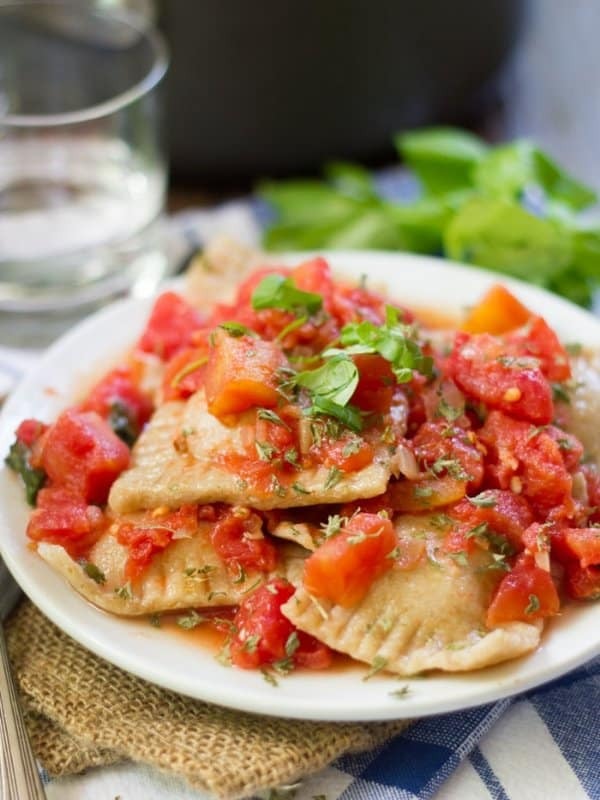 A cashew tofu filling mimics ricotta in these pillowy ravioli, which are then topped off with a rich pomodoro sauce, punctuated by crisp, fresh basil. 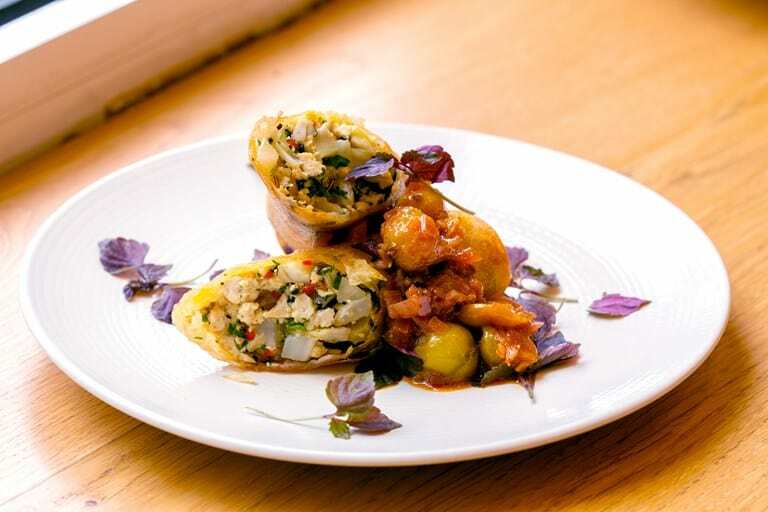 A humble tofu parcel is packed with a diverse range of aromatic flavours from smoked tofu, fennel, lemongrass and chilli, and is then cooked until crispy and golden. 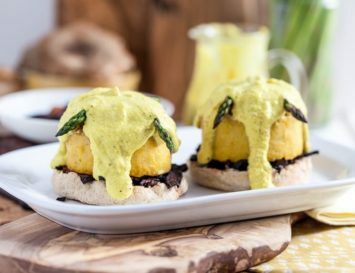 Serve alongside a spiced chutney, and to keep it 100% vegan, simply ditch the egg wash for a little water. This dish comes from British chef Jamie Oliver. 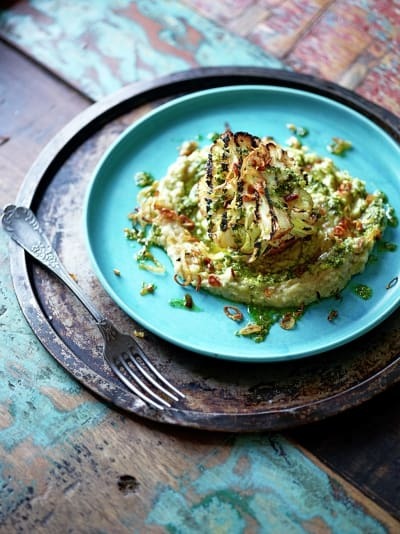 Grilled cauliflower is teamed with pesto-spiked white bean mash and crispy onions to deliver a rich, flavourful dish that can be served as a starter or main. 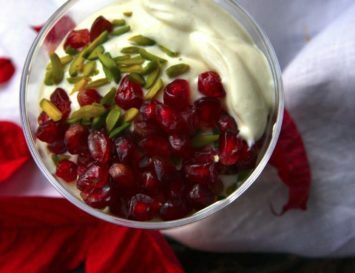 Simple, un-stodgy desserts are the perfect way to end a gourmet meal. Here, the pineapple’s sweetness is enhanced when it’s caramelised. 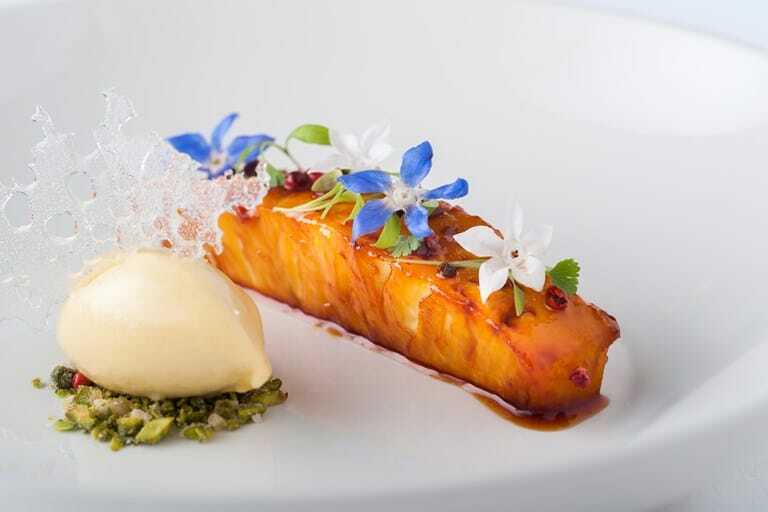 This sous vide pineapple is decorated with edible flowers and is served alongside a tropical sorbet served atop crushed pistachios. Delicious! 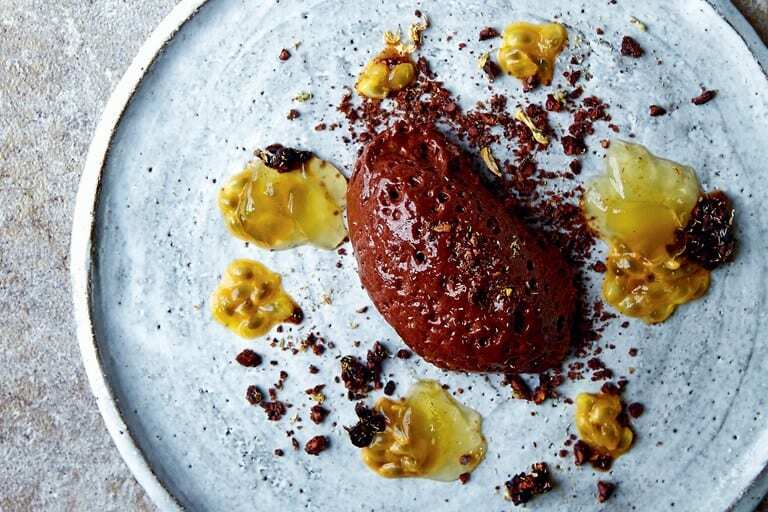 Rich, vegan chocolate mousse served alongside fragrant chamomile jelly and caramelised cocoa nibs . . . who wouldn’t go wild for this dinner party dessert? Fresh passionfruit is the perfect way to finish this dish off, as the sweet yet tangy flavours compliment the rich mousse. 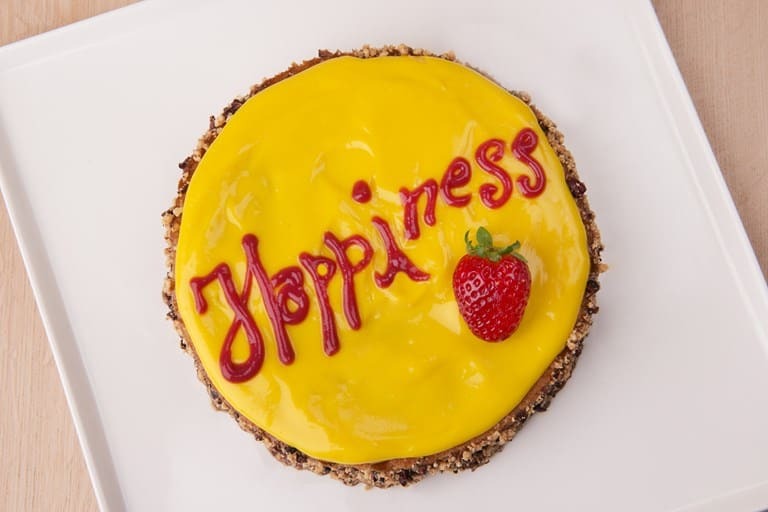 A soft vegan sponge cake is topped works perfectly with the hazelnuts, lemon and juicy strawberries that provide a range of complementary flavours and textures. To keep this recipe vegan friendly, use agave syrup instead of honey when making the strawberry icing. Considering it’s usually made from layers of sponge, cream and mascarpone, a tiramisu may not spring to mind when you consider a vegan dessert. But thanks to some clever tricks, this rich vegan tiramisu with dark chocolate mousse and fennel cream exists. Anyone else drooling? After a meal, I sometimes prefer to skip dessert and to finish the evening with a coffee, usually an espresso. I’m not sure why, it just feels both indulgent and refreshing. 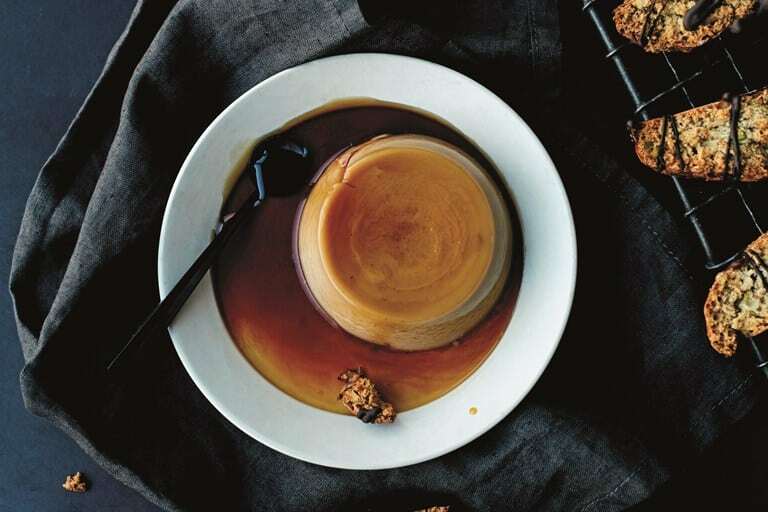 But if this vegan crème caramel recipe was on the menu, I would definitely opt for this! Pumpkin pie is lovely, but it’s pretty heavy going. Why not use pumpkin to make this lighter meringue pie recipe? 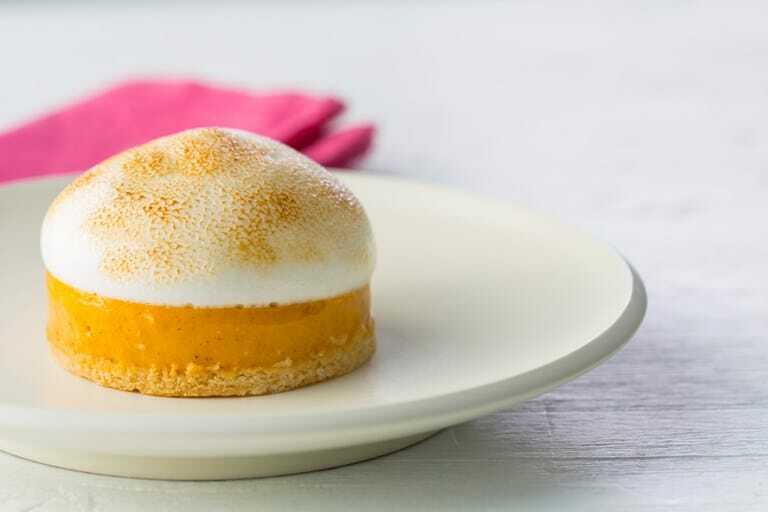 The fluffy Italian meringue is made from aquafaba (chickpea water) and the creamy filling is made using coconut and delicata squash. A truly wonderful sweet pastry recipe to add to your repertoire. Main image photo credit here.